The Chicago Steel swept the Lincoln Stars this past weekend at the IceBox with a 3-1 victory on Friday, and a 5-4 win on Saturday. The Stars have now lost 5 in a row and 11 of their last 13 games. After the two regulation losses, the Stars are still in last place in the USHL western conference with a record of 13-23-5 (31 points). The Stars are 14 points out of a playoff spot in the USHL western conference with 19 games remaining in the regular season. Click here to view the current league standings. I was hoping to see a different Stars team this weekend after the two embarrassing losses last weekend, but I didn't see a lot of improvement to be honest. There were flashes of it, specifically in the first period of Friday's game and the third period of Saturday's game, but that was about it. I'm still seeing the same mistakes made that I saw at the beginning of the season and that's not encouraging. The Stars got out to a quick 1-0 lead after a strong first period, but the Steel scored three unanswered goals to win on Friday the 13th. This was the third straight contest the Stars scored the first goal of the game but still lost. I really liked the energy the Stars showed in the first twenty minutes of this game. They were rewarded with a goal scored at the 7:22 mark of the first period just as a Lincoln powerplay ended. A point shot from defenseman Ryan Jones was deflected by Ethan Price, which was his 2nd goal in a Stars uniform. Unfortunately, the Stars were not able to take that 1-0 lead into the first intermission as the Steel scored a late goal to tie the game at 1-1. This was probably the one goal Stars goaltender Cam Hackett would want back from this game. It was a high, short-side shot that got past his blocker and into the net. Shots were 14-9 in favor of Lincoln in the first period. It was yet another sluggish second period for the Stars in this particular game, but I thought Cam Hackett's play was the key to keeping the Steel off the scoreboard. Shots were 10-6 in favor of Chicago in the middle period. I highlighted Chicago Steel forward Robby Jackson in the weekend preview article, and he showed why he is considered a sure-fire NHL draft pick in 2015 with a big goal early in the third period. This was a frustrating play to watch because the Stars had the players to defend the Steel rush, but Lincoln's defensemen forgot to pick up Jackson who snuck in on the back door. The two Lincoln defensemen keyed on the Steel player who carried the puck into the zone, and forgot about Jackson who was behind them streaking towards the goal. The pass over to the wide open Jackson was enough for him to one-time it past Hackett to score the eventual game-winner. Game over. This particular play typifies how the season has gone for the Stars. 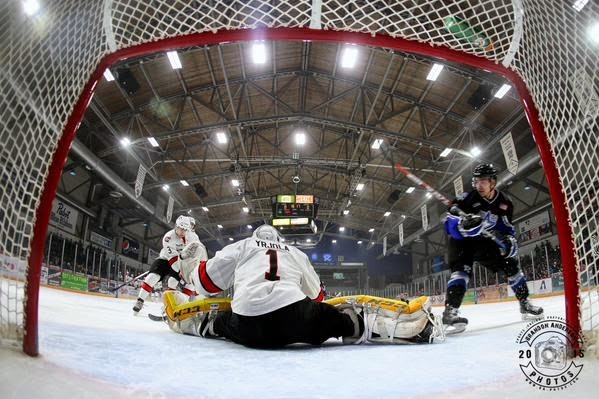 The Steel added a powerplay goal later in the third period to increase their lead to 3-1, which completed the scoring. Lincoln outshot Chicago 13-6 in the final period, but Steel goaltender Lassi Yrjola came up big. I thought Yrjola had a very good game, and was a big reason why the Steel were able to get the two points. Stars really peppered him in the first and third periods, but he stood tall. Stars outshot the Steel 33-25 overall. Lincoln goaltender Cam Hackett stopped 22 of 25 in the loss, while Chicago goaltender Lassi Yrjola stopped 32 of 33 for the win. Lincoln finished 0-for-4 on the powerplay, while Chicago finished 1-for-4. Overall, it was an improvement over the disastrous play last weekend but it was still nowhere near a full 60 minute effort. A third period comeback from the Stars fell just short as the the Chicago Steel used a strong 2nd period to skate past Lincoln and earn the weekend sweep. The Steel got on the scoreboard first with a goal at the 8:51 mark of the first period. Some of the fans around me joked that since the opposition scored fired, maybe the Stars would win this game. Joe Lappin gave the Stars some life in the latter part of the first period with a goal scored at the 16:39 mark. On the play, Patrick Polino drove hard to the Steel net with the puck before passing it quickly to Lappin who slapped the loose puck it into the open net. The score remained 1-1 after one period. Shots were 9-8 in favor of Chicago in the opening twenty minutes. I'm not sure what the deal is with 2nd periods and this team, but once again the wheels came off for the Stars as the Steel outscored Lincoln 4-1 in the second. It's like the movie "Groundhog Day." It's the same second period relieved just about every home game. It was ugly. Ryan Jones' goal at the 13:18 mark split the four goals scored by Chicago in the second period. The Steel outshot the Stars 17-9 in the second. Stars goaltender Peyton Jones didn't get much help. In the third, the Steel sat back a bit and the Stars woke up from their second period slumber with a couple of late goals to make it interesting. First, it was Biagio Lerario scoring his 14th goal of the season at the 16:34 mark to pull the Stars to within two goals. On the play, Lerario used his speed to skate into the zone with the puck before firing a laser glove high past Yrjola. 14 seconds after Lerario's goal, Walt Hopponen scored to pull Lincoln to within one goal. On the play, Joe Lappin skated from behind the Steel net before firing a nice pass across the top of the crease to Hopponen who wristed the puck into the open net. Suddenly, the Stars and the IceBox had life. Try as they might in the last few minutes, the Stars were unable to score the game-tying goal. The effort was there in the latter half of the third period, but they just couldn't score enough goals to offset the bad second period. Chicago outshot Lincoln 30-28 overall. Stars goaltender Peyton Jones stopped 25 of 30 in the loss, while Lassi Yrjola picked up his second win of the weekend with 24 saves on 28 shots. Chicago finished 0-for-3 on the powerplay while the Stars went 0-for-5. In the past 8 games, the Lincoln Stars are 3-for-32 on the powerplay (that's a 9% success rate). Not so good. Considering the Steel had just fired their head coach a few days ago, and the fact that they had struggled a bit as of late, I really thought the Stars would be able to get at least 2 points out of this weekend. I'm not sure if it's a mental thing, but it's frustrating to watch this team struggle when you know the talent is there. I've given up trying to figure it out. Not a bad start for Chicago interim coach Dan Boeser. In his first two games as a USHL head coach, his team comes into Lincoln and beats the Stars in back-to-back games at the IceBox. Boeser didn't have much help behind the bench either, as he was the only coach who made the trip. The Stars will take on the red-hot Tri-City Storm in a home-and-home series next weekend with a game in Lincoln on Friday, and then a game in Kearney on Saturday. The Storm have won 12 of their last 13 games. It has gotten to the point that fans around us know we're going to lose, and instead root for free chicken. I'm not giving up on this team--like Yeti said, I think the talent is there. We may not go to the playoffs, but we DO have quite a bit of time left to continue to IMPROVE. This team still needs our support--they haven't given up on themselves and we won't either. GO STARS! I think the defenseman that Hull was talking about was Lucas Jaycox, whom the Stars selected in the 2014 USHL Entry draft. He currently plays for Warroad High School in Minnesota, same high school former Stars forward Jared Bethune used to play for. Very good prospect. 6'1, 185 pounds. Could be a NHL draft pick this spring. Jaycox is definitely a guy the Stars will bring in full time next year, so getting him here after his high school season ends would be beneficial for his development. Gives him a taste of the USHL before next season. As for the "Important Dates" page on the USHL.com website, I believe that four affiliate players can be brought up to play as long as their other seasons are over with starting on March 1st. I believe that's how it works, but I'm not sure. I'm hoping the Stars bring up forward Ethen Frank as well. He's played very, very well for the Omaha AAA U16 program this season and could be a full time player next season as well. The USHL trade deadline is March 2nd, so if any current players are going to be traded for draft picks/younger players that will have to happen before that date. yeah, the feb. 10th date said "final day to add affiliate player to roster" so I checked our roster and nobody had been added yet--I just figured the Stars don't always post things right away. The feb. 15th date said "4 affiliate players may begin to play an unlimited amount of games", yet the mar. 1st date said no one could play till their season was completed. So that was about as clear as mud for me---thanks for trying to clear that up,-- makes a little more sense now. I'm anxious to see this Jaycox kid on the ice, but it'd be great if E. Frank could come back and play a few more games too--I think he has the potential to be a dominant player for us.